Winter time in Wallowa County is definitely a slower time than our busy summer tourist season. However, don’t think that Wallowa County is dormant during the winter! Several fun winter activities and things to do happen in Joseph, Oregon during the winter months. Oregon’s only Iditarod and Yukon Quest Qualifier is the popular Eagle Cap Extreme. Typically held the 3rd week of January, this extreme dog sled event includes several different race distances. One is a 12 dog, 200 mile race as qualifiers for the Alaskan Iditarod and Yukon Quest. Another distance is the 8 dog 100 mile race, and a 6 dog mid-distance for 62 miles spanning 2 days. The Eagle Cap Extreme runs thru the rugged Wallowa Mountains in NE Oregon. It is a challenging adventure for the teams on trail runs running through breathtaking scenery. Fans along the trail offer plenty of encouragement, and a pre-race highlight are a bunch of school kids flooding the streets of their home town and enjoy the Vet Checks which provides them up front and personal chances to meet the Mushers and interact with the dogs. Race day starts at 1:00 from Fergi Ski Area, about 9 miles southeast of Joseph. Fans and school children flock to the starting chute and root for their favorite team as they depart on their adventure. Snowmobiling in Wallowa County is one of our family’s favorite winter activities! We are fortunate enough to go several times a winter, joined by family and friends. There are a couple of different activities that may interest you if you too love to snowmobile! The Wallowa County Gamblers Snowmobile Club has an annual goal to promote snowmobiling and to establish a trail system in Wallowa County. Started in January 1972, this active and popular club is passionate about keeping the trails open for snowmobile use. Salt Creek is the base for this great snowmobile club as well as the starting point of their infamous Poker Run held every January. For more information or to get involved in the Wallowa County Gamblers Snowmobile Club and the Poker Run, meetings are held every Monday at the Enterprise Pacific Power meeting room in Enterprise. 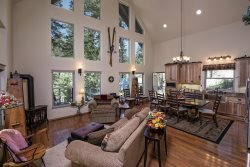 A winter vacation at Wallowa Lake can include snuggling up with a good book at one of our vacation cabin rentals or venturing out into our community and enjoy skiing at Fergi, snowmobiling at Salt Creek Summit or taking in the adventurous Eagle Cap Extreme Sled Dog Race. We want to be your choice for lodging while staying at Wallowa Lake.